Performing effective chemical separations-a step-by-step guide to the most commonly used techniques. How do experienced analysts go about making a chemical separation work? Through precise, detailed coverage of the principles, equipment, and techniques involved, this combination laboratory manual and reference source gives readers a working knowledge of an impressive array of separation methods. In forty-two chapters, it explores all major categories of separation, including those involving phase changes, extraction, chromatography, ion-exchange resins, electric fields, flotation, membranes, and miscellaneous techniques. 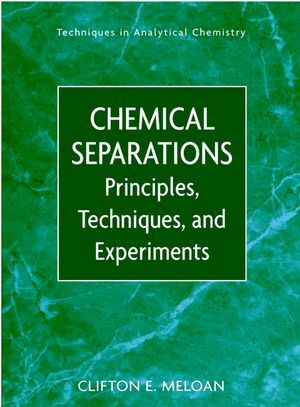 With an emphasis on everyday practice rather than theory, Chemical Separations explains the principles and parameters of these methods with a minimum of mathematics, while providing 59 specific experiments to demonstrate proper procedures. Drawn from well-known commercial and academic laboratories and approved by national standard-setting organizations, these experiments feature step-by-step protocols for each separation scheme, precise instructions on setting up the apparatus, and helpful checklists for essential chemicals and supplies. With Chemical Separations as their guide, laboratory analysts and newcomers to chemical analysis will learn how to obtain quality analysis using commercial products, natural samples, and proven real-world laboratory techniques. CLIFTON E. MELOAN, phd, is Professor Emeritus of Analytical Chemistry at Kansas State University, Manhattan, Kansas. Extensively published in the field, Dr. Meloan has served as a science advisor to the FDA for nearly 30 years. Steam and Immiscible Solvents Distillation. Countercurrent (Extraction) Chromatography: The Ito Coil-Planet Centrifugal Extractor. Displacement and Multiple Column Partition Chromatography. SEPARATIONS INVOLVING ION EXCHANGE RESINS. Ion Retardation, Ion Exclusion, and Ligand Exchange. Ion Focusing, SDS, and Two-Dimensional Electrophoresis. Foam Fractionation, Gas-, and Liquid-Assisted Flotation. Gas Analysis by Portable Orsat.